They are here with a smile to take your order. When Steve C was a boy he always loved eating a good Chicago hot dog. As time passed and he grew up it became harder to find a good hot dog place. There were hot dog places, but not many that made it the way he remembered as a youth. As time passed he got married and raised a family and never lost that memory of a good tasting hot dog. He also started to dream about opening a hot dog restaurant that could also serve some of the all time favorite foods. One day he decided that it was time to bring back the good old hot dog taste to the western suburbs of Chicago. He knew that if he missed that old fashioned hot dog taste then other people did too. He searched the area and found a small hot dog restaurant that had been closed for a while. Now when we say small -- it was small. If he had 10 or more people in the restaurant, they were shoulder to shoulder. So regardless of its size, he opened his restaurant up on Barrington Road in Hanover Park, Illinois. What he knew was that if he made a good dog, hamburger, Italian beef sandwich, Italian sausage, Polish sausage and more, the people would come. The people came and enjoyed his food and a new generation of people got to experience that Chicago Style Hot Dog and more. As his business grew, so did the ribbing he got about how small his restaurant was. His dream grew and he wanted to serve his customers better. How nice would it be to have a larger place where multiple groups could come and sit down to enjoy their meals. He talked it over with his wife and daughter and they agreed that it was the time to do something as long as they served the customers high quality food as they did in the past. Plus, it was decided that all burgers would be freshly packed from good ground beef and that they would use fresh mushrooms. Have you heard the story behind the Mr. C’s Hot Dogs and More restaurant, well hold on to your hat and read about the legend. 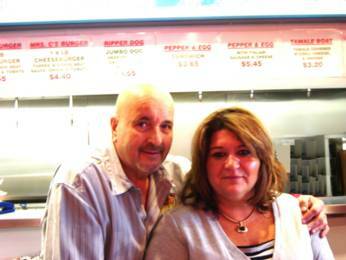 Meet Mr. & Mrs. C.
They hope that you enjoy your food and they are alway ready to hear what you have to say. Come Rock & Roll over to see us at Mr. C's restaurant. 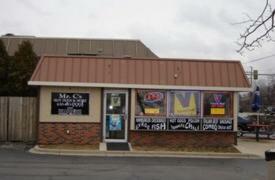 Mr. C's Original Restaurant, that opened in Hanover Park, was a great beginning and is now closed.